Poodles can do most things any dog can do. Some are even known to be used as cattle and sheep herders on farms in Central Western New South Wales. 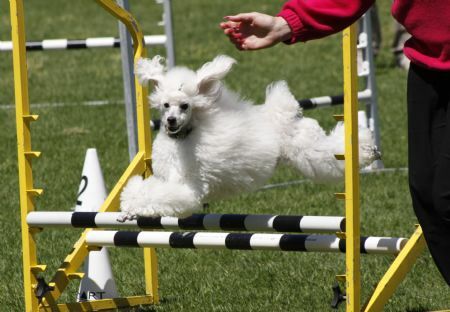 There are many activities you can enjoy with your Poodle. To find out more you can visit www.dogsnsw.org.au/ and click on Resources, Dogs NSW Magazine, Articles, Well Being, Fun and Games – 9 ways to keep fit and active. On the Poodle Club website you can read the pages on Flyball, Ball Herding (Treiball) and Dances with Dogs to find out more about these excellent fun activities. You can find out more about Conformation Shows, Obedience Trials and Poodle Club Fun Days by looking at the Shows and Trials page. The website www.vipoodle.org/ is another interesting site where you can find out much more about how to enjoy your life with your Poodle.